When NATO celebrated its 70th anniversary in early April, feelings in Germany were mixed. Chancellor Angela Merkel’s government dutifully praised NATO’s achievements but could not hide its embarrassment when US President Donald Trump once again criticized Germany for failing to keep its promises on military spending. Yet Merkel’s government is doing exactly what most Germans want. A clear majority says that NATO is important to secure peace and useful to Germany, according to a recent infratest dimap poll. Yet the same poll also shows a majority opposed to increasing military spending to the two percent of GDP to which all NATO members committed, Germany included. Have-your-cake-and-eat-it is not an unusual attitude anywhere. But what is striking is the extent to which Germany indulges in it. After more than 70 years of peace and a decade of economic growth, this whole nation has wrapped itself deeply into the comfort zone. Germans do not want to know about threats or conflicts that might necessitate any kind of action. Close your eyes, and those conflicts might go away. By blinding itself to the risks and threats around it, Germany has also renounced strategic thinking: about its role today and in the future; about defining who its friends and enemies are, and anything in-between; and about resolving conflicts between its economic interests and its political and moral code. There are three areas where this refusal to think strategically is particularly noticeable: first, in the relations with the United States and Russia; second, concerning military matters; and third, in Germany’s failure to lead Europe. In all three areas, there is a pronounced lack of leadership from the chancellor and the political elites. The effect is a slow erosion of the political loyalties and convictions that hold the country together. Take the dramatic rise of anti-Americanism, fueled not only by US President Donald Trump’s dreadful politics but also by Merkel’s refusal to define Germany’s core interests in a continuing relationship with Washington. In February, a ZDF Politbarometer poll that showed that 86 percent of Germans do not believe that under Trump’s leadership, the United States is a reliable partner for Europe’s security. In fact, Germans are far more worried about Trump (82 percent) than about Vladimir Putin (56 percent)—despite the Russian president’s aggression against Ukraine and his continuing efforts to undermine democracy and social cohesion in the West. 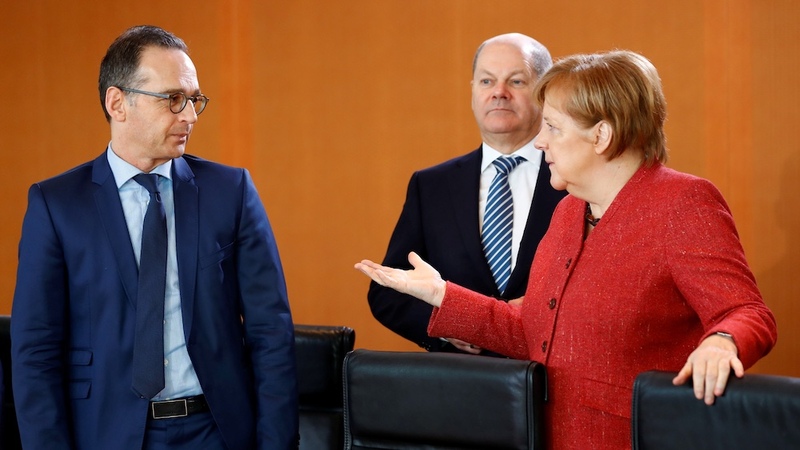 Merkel, in the meantime, continues to support the controversial Nord Stream 2 pipeline, but the chancellor makes little effort to explain her reasons for doing so. Nor does she encourage a debate on the future relations between Russia and Europe. Germany’s highly ambiguous relationship with its military follows a similar pattern. Merkel never talks about the Bundeswehr or NATO, if she can avoid it—it’s a topic she personally doesn’t much care for and which won’t win her any votes. If the German armed forces today are underfunded and ill-equipped, it’s largely due to her governments’ profound lack of interest. Lack of commitment also means that Germany’s elites have failed to build any kind of popular consensus around the Bundeswehr: why it exists, what it should do, and how much that should be worth to the taxpayer. As a result, a sizeable part of the population considers the use of hard power illegitimate on principle. A fine example of that kind of thinking was recently set by the Social Democratic Party, Merkel’s junior partner in government. At an SPD congress in Berlin, the local party delegates decided that the Bundeswehr should be banned from visiting schools in order to inform students about its mission. If implemented, this would be a break with a long-standing tradition throughout Germany. A side effect of this anti-military current is the strong public opposition against arms exports. While from a moral point of view, this is certainly a viable choice, it carries a price: without exports, the German or European arms industry cannot produce weapons systems in sufficient numbers to make them affordable for the Bundeswehr. This also causes huge strain in Franco-German relations. France, which has far fewer qualms about exporting arms, sees the future of European defense in danger if it becomes impossible to develop and build major weapons systems with Germany. Defense is only one area in which France’s President Emmanuel Macron is gnashing his teeth at Berlin’s lack of strategy and consistency. It has been 18 months since Macron gave his Sorbonne speech, an impassioned appeal to build a much more integrated and powerful European Union. But while Merkel and her ministers have been keen to push forward with bilateral and EU agreements for specific policies, they have remained silent on the big picture: what is Germany’s vision for Europe? What are the institutions and policies that will allow the EU to regain popular support and defend Europe’s position in the world? It is impossible to define the future of Europe without a clear definition of Germany’s own interests vis-à-vis the rest of the world. Or without defining the means to pursue those interests. Yet this isn’t happening, and as a result, Germany has turned into a black hole at the center of Europe: the biggest and most powerful country, indispensable to the EU’s survival and success—but too deeply ensconced in its comfort zone to face up to its responsibilities.